To keep with tradition, it’s time to expand my collection of 4th-of-July columns. In 2010, I contemplated the issue of libertarians and patriotism. My view, for what it’s worth, is captured by this t-shirt. In 2011, I pondered research about the partisan implications of patriotism and also created a satirical Declaration of Dependency for my left-wing friends. In 2012, I shared an inspirational video about freedom and individualism from Ronald Reagan. In 2013, I discussed the proper meaning of patriotism in the aftermath of revelations about NSA snooping. In 2015, I waded into the controversial topic of what happens when flag burning meets the modern regulatory state. In 2016, I looked at how government has increased the cost of celebrating Independence Day. Today, we’re going to commemorate a great speech by one of America’s best Presidents. In 1926, Calvin Coolidge spoke on the 150th anniversary of the signing of the Declaration of Independence. Here’s some of what he said. When we come to examine the action of the Continental Congress in adopting the Declaration of Independence in the light of what was set out in that great document and in the light of succeeding events, we can not escape the conclusion that it had a much broader and deeper significance than a mere secession of territory and the establishment of a new nation. …It was not because it was proposed to establish a new nation, but because it was proposed to establish a nation on new principles, that July 4, 1776, has come to be regarded as one of the greatest days in history. …In its main features the Declaration of Independence is a great spiritual document. It is a declaration not of material but of spiritual conceptions. Equality, liberty, popular sovereignty, the rights of man — these are not elements which we can see and touch. They are ideals. …It was in the contemplation of these truths that the fathers made their declaration and adopted their Constitution. It was to establish a free government, which must not be permitted to degenerate into the unrestrained authority of a mere majority or the unbridled weight of a mere influential few. …These are our guaranties of liberty. As a result of these methods enterprise has been duly protected from confiscation, the people have been free from oppression. If you have the time, click on the link and read the entire speech. But if you don’t have time, I hope the passages I excerpted reveal Coolidge’s appreciation for the philosophy of American independence. I also like how he links those principles to economics, which is nicely captured in the last sentence. Sadly, the Supreme Court no longer protects our economic liberties (John Roberts providing the most recent example), but it was nice while it lasted. Speaking of which, here’s a great conversation between James Buchanan and Walter Williams on the meaning and importance of the Constitution. But that’s just the tip of the iceberg. They cover lots of additional material, including spending limits, tax reform, and free trade. For what it’s worth, my favorite part of the conversation is about how markets are mutually beneficial, whereas government is a zero-sum, or negative-sum game. 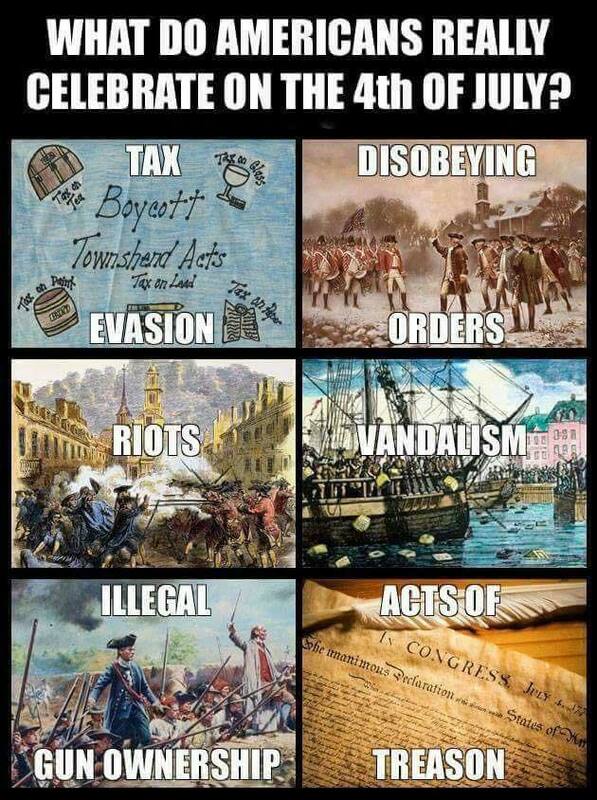 Let’s close with a celebration of the great American tradition of civil disobedience against the state. Sadly, with the likely exception of gun owners, we no longer seem to have the same ornery attitude as our ancestors. Though Charles Murray has a plan to recreate a culture of civil disobedience. P.S. Here’s a first-hand account of what patriotism means. I generally use Texas as a good example when discussing public policy. Particularly compared to places such as California. I like the sensible attitude about guns, but the absence of an income tax is particularly admirable when considering economic issues, and I confess to being greatly amused when I read about jobs and investment escaping high-tax states like California and moving to the Lone Star State. 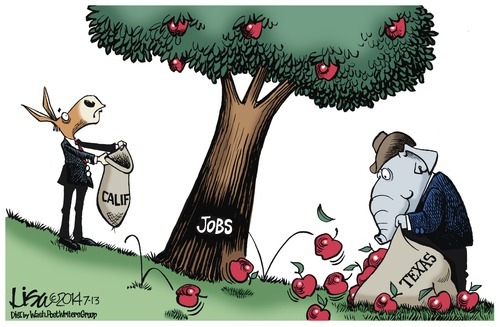 But being more pro-market than California is a low bar to clear. And I’ve written that government is too big in Texas. And now, because of Hurricane Harvey, I have another reason to criticize the state. Texas has a law against “price gouging,” which means politicians there (just like the politicians in places like Venezuela) think they should get to determine what’s a fair price rather than allow (gasp!) a free market. The state’s Republican Attorney General is even highlighting his state’s support for this perverse example of price controls. >Price gouging by Texas merchants in the path of Hurricane Harvey has drawn the attention of Texas Attorney General Ken Paxton, who said Saturday that his office is looking into such cases. …”We’ll be dealing with those people as we find them,” he said. …Paxton issued a warning about price gouging Friday as the hurricane approached the Texas coast. Texas law prohibits businesses from charging exorbitant prices for gasoline, food, water, clothing and lodging during declared disasters. Paxton is right about Texas law, but he is threatening to enforce a terrible policy. To help explain why Texas law is bad and why the Attorney General is misguided, here’s a video from John Stossel on so-called price gouging. It’s disgusting that Mississippi arrested John. The guy should have received a medal for putting his money at risk to serve others. To augment Stossel’s analysis, here’s a video from Learn Liberty that explains why politicians shouldn’t interfere with the price system. And here’s Walter Williams discussing the role of “windfall profits” and how high returns encourage the reallocation of resources in ways that benefit consumers. The bottom line on this issue is that buyers understandably want low prices, particularly in emergency situations. But that makes no economic sense. However, since buyers generally outnumber sellers, politicians will always have an incentive to demagogue on the issue. I’m not surprised when we get economic illiteracy from certain politicians. Nonetheless, it’s very disappointing when Texas lawmakers sink to that level. I hope Mr. Paxton at least is feeling guilty. P.S. But I’ll close on an upbeat note by sharing my collection of Texas-themed humor: Here, here, here, and here. The biggest mistake of well-meaning leftists is that they place too much value on good intentions and don’t seem to care nearly as much about good results. Pope Francis is an example of this unfortunate tendency. His concern for the poor presumably is genuine, but he puts ideology above evidence when he argues against capitalism and in favor of coercive government. Here are some passages from a CNN report on the Pope’s bias. Wow, I almost don’t know how to respond. So many bad ideas crammed in so few words. If you want to know why Pope Francis is wrong about capitalism and human well-being, these videos narrated by Don Boudreaux and Deirdre McCloskey will explain how free markets have generated unimaginable prosperity for ordinary people. But the Pope isn’t just wrong on facts. He’s also wrong on morality. This video by Walter Williams explains why voluntary exchange in a free-market system is far more ethical than a regime based on government coercion. Very well stated. And I especially like how Walter explains that markets are a positive-sum game, whereas government-coerced redistribution is (at best) a zero-sum game. Professor Williams wasn’t specifically seeking to counter the muddled economic views of Pope Francis, but others have taken up that challenge. Writing for the Washington Post, George Will specifically addresses the Pope’s moral preening. Pope Francis embodies sanctity but comes trailing clouds of sanctimony. With a convert’s indiscriminate zeal, he embraces ideas impeccably fashionable, demonstrably false and deeply reactionary. They would devastate the poor on whose behalf he purports to speak… Francis deplores “compulsive consumerism,” a sin to which the 1.3 billion persons without even electricity can only aspire. He specifically explains that people with genuine concern for the poor should celebrate industrialization and utilization of natural resources. Poverty has probably decreased more in the past two centuries than in the preceding three millennia because of industrialization powered by fossil fuels. Only economic growth has ever produced broad amelioration of poverty, and since growth began in the late 18th century, it has depended on such fuels. …The capitalist commerce that Francis disdains is the reason the portion of the planet’s population living in “absolute poverty” ($1.25 a day) declined from 53 percent to 17 percent in three decades after 1981. So why doesn’t Pope Francis understand economics? Perhaps because he learned the wrong lesson from his nation’s disastrous experiment with an especially corrupt and cronyist version of statism. Francis grew up around the rancid political culture of Peronist populism, the sterile redistributionism that has reduced his Argentina from the world’s 14th highest per-capita gross domestic product in 1900 to 63rd today. Francis’s agenda for the planet — “global regulatory norms” — would globalize Argentina’s downward mobility. George Will is right that Argentina is not a good role model. And he’s even more right about the dangers of “global norms” that inevitably would pressure all nations to impose equally bad levels of taxation and regulation. Returning to the economic views of Pope Francis, the BBC asked for my thoughts back in 2013 and everything I said still applies today. P.S. Let’s close by taking a look at a few examples of how the world is getting better thanks to capitalism. 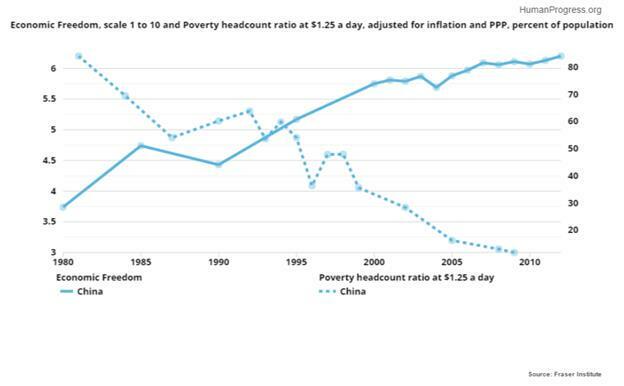 We’ll start with an example of how China’s modest shift toward markets has generated huge reductions in poverty (h/t: Cato Institute). Now let’s look at how a wealthier society is also a safer society (h/t: David Frum). 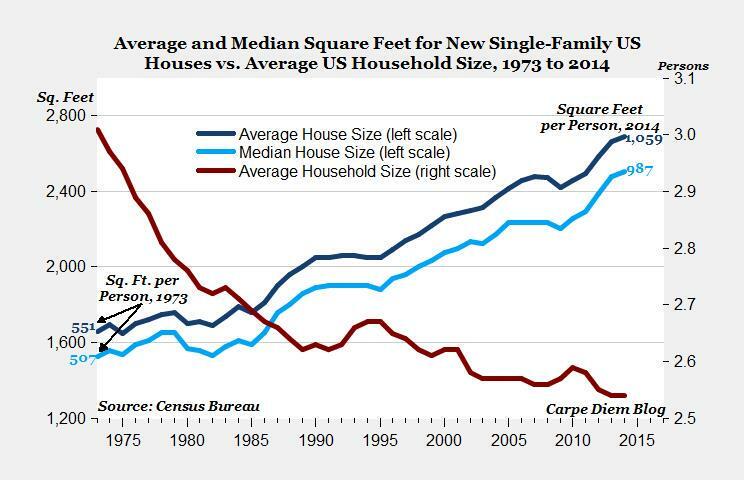 Or how about this remarkable measure of higher living standards (h/t: Mark Perry). 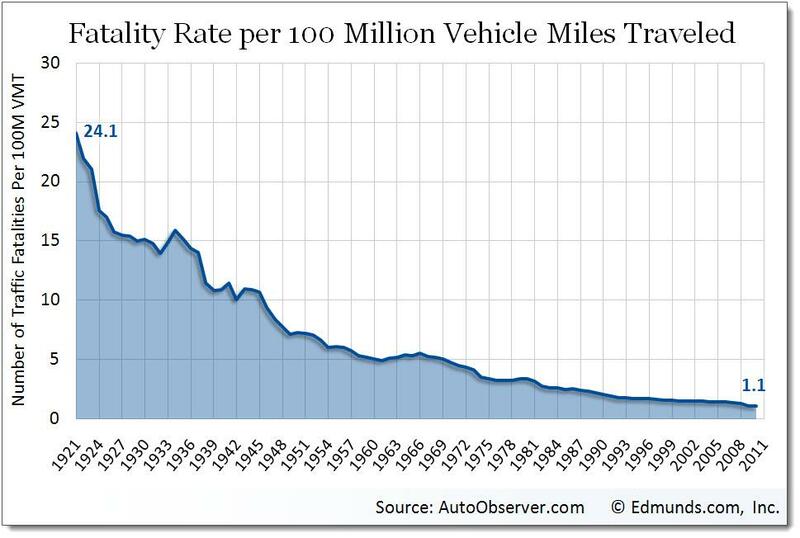 Here’s an amazing chart showing how something as basic as light used to be a luxury good but now is astoundingly inexpensive for the masses (h/t: Max Roser). These are just a few random examples of how free markets, when not overly stifled by government, can produce amazing things for ordinary people. We may not notice the results from one year to the next, but the results are remarkable when we examine data over longer periods of time. 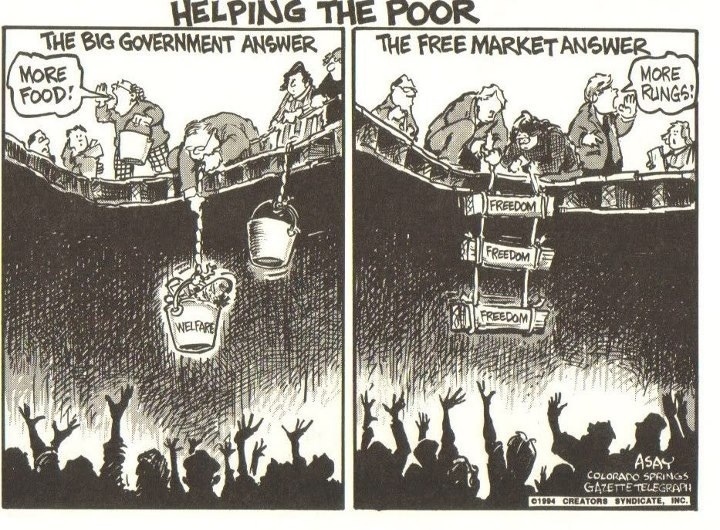 And if our specific goal is to help the poor, there’s no question that economic growth is far more effective than government dependency. Which is why I’ve explained that it’s better to be a poor person in a capitalist jurisdiction. I’d much rather be a poor person in a jurisdiction such as Hong Kong or Singapore rather than in a “compassionate” country such as France. France might give me lots of handouts, but I’d remain poor. In a free-market society, by contrast, I could climb out of poverty. P.P.S. Methinks Pope Francis would benefit from a discussion with Libertarian Jesus. What’s the most important factor for economic progress? There are several possible answers to that question. We can take a big-picture view and argue that the key is free markets and small government, and there certainly is lots of evidence in favor of this assertion when you compare countries over time. But what if we narrow our focus and try to identify, for instance, the key characteristic of a free market. At times, I’ve highlighted the importance of both property rights and the price system. Private property gives people the right incentives to both produce and conserve, a lesson learned early in American history. An unfettered price system is a mechanism that best ensures resources are efficiently utilized to serve consumers. But we need to augment this list by also including the valuable role of the profit motive. This Prager University video, narrated by my friend Walter Williams, succinctly explains the issue. I especially like the section where Walter asks what institutions and entities leave us happy and contented. The answer, at least for most of us, is that we’re more likely to be satisfied in our dealing with private companies operating in competitive markets. That’s because the profit motive gives them an incentive to treat us well, both to boost their reputations and so we’ll be repeat customers. Simply stated, in a true free market, entrepreneurs, investors, and business owners can only become rich by providing consumers with things that make our lives better. But our dealings with government (or government-enforced monopolies like cable companies) tend to be less rewarding, whether it’s because bureaucrats are taking our money, bossing us around, or simply treating us poorly. So the next time some politician or pundit complains about “evil profits,” just remember Walter’s wise words from the video. P.S. I’ve shared two other videos from Prager University, one of the Laffer Curve and one about statist policies and the Great Depression. They’ve both very much worth watching. P.P.S. It goes without saying (but I’ll say it anyhow) that profits are only admirable if they’re earned honestly. There are fraudsters in private markets who rip off consumers and there are crony capitalists who use coercive government policies to line their pockets. These groups deserve disdain and punishment. P.P.P.S. Walter Williams is one of America’s best public intellectuals. I’ve cited his work numerous times, but your first stop, in learning more about him, is this video from Reason TV. What’s the relationship between the Rahn Curve and the Laffer Curve? For the uninitiated, the Rahn Curve is the common-sense notion that some government is helpful for prosperous markets but too much government is harmful to economic performance. Even libertarians, for instance, will acknowledge that spending on core “public goods” such as police protection and courts (assuming, of course, low levels of corruption) can enable the smooth functioning of markets. Some even argue that government spending on human capital and physical capital can facilitate economic activity. For what it’s worth, I think that the government’s track record in those areas leaves a lot to be desired, so I’d prefer to give the private sector a greater role in areas such as education and highways. The big problem, though, is that most government spending is for programs that are often categorized as “transfers” and “consumption.” And these are outlays that clearly are associated with weaker economic performance. This is why small-government economies such as Hong Kong and Singapore tend to grow faster than the medium-government economies such as the United States and Australia. And it also explains why growth is even slower is big-government economies such as France and Italy. 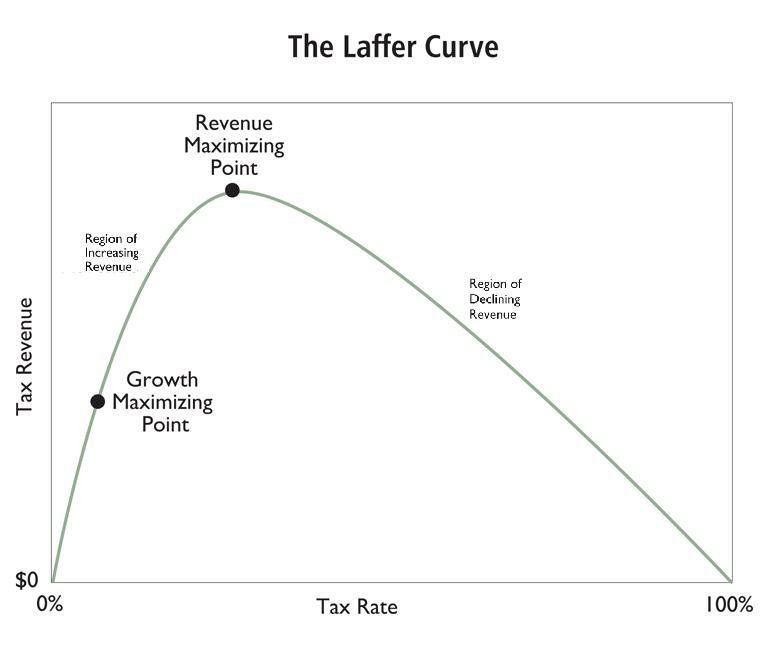 The Laffer Curve, for those who don’t remember, is the common-sense depiction of the relationship between tax rates and tax revenue. The essential insight is that taxable income is not fixed (regardless of the Joint Committee on Taxation’s flawed methodology). When tax rates are low, people will earn and report lots of income, but when tax rates are high, taxpayers figure out ways of reducing the amount of taxable income they earn and report to government. This is why, for instance, the rich paid much more to the IRS after Reagan lower the top tax rate from 70 percent to 28 percent. So why am I giving a refresher course on the Rahn Curve and Laffer Curve? Because I’ve been asked on many occasions whether there is a relationship between the two concepts and I’ve never had a good answer. But I’m happy to call attention to the good work of other folks, so here’s a very well done depiction of the relationship between the two curves (though in this case the Rahn Curve is called the Armey Curve). I should hasten to add, by the way, that I don’t agree with the specific numbers. I think the revenue-maximizing rate is well below 45 percent and I think the growth-maximizing rate is well below 30 percent. But the image above is spot on in that it shows that a nation should not be at the revenue-maximizing point of the Laffer Curve. Since I’m obviously a big fan of the Rahn Curve and I also like drawing lessons from cross-country comparisons, here’s a video on that topic from the Center for Freedom and Prosperity. Well done, though I might quibble on two points, though the first is just the meaningless observation that the male boxer is not 6′-6″ and 250 lbs. My real complaint (and this will sound familiar) is that I’m uneasy with the implication around the 1:45 mark that growth is maximized when government spending consumes 25 percent of economic output. This implies, for instance, that government in the United States was far too small in the 1800s and early 1900s when the overall burden of government spending was about 10 percent of GDP. But I suppose I’m being pedantic. Outlays at the national, state, and local level in America now consume more than 38 percent of economic output according to the IMF and we’re heading in the wrong direction because of demographic changes and poorly designed entitlement programs. So if we can stop government from getting bigger and instead bring it back down to 25 percent of GDP, even I will admit that’s a huge accomplishment. Libertarian Nirvana would be nice, but I’m more concerned at this point about simply saving the nation from becoming Greece. P.S. I’ve shared numerous columns from Walter Williams and he is one of America’s best advocates of individual liberty and economic freedom. Now there’s a documentary celebrating his life and accomplishments. Here’s a video preview. Given Walter’s accomplishments, you won’t be surprised to learn that there’s another video documentary about his life. Back in 2012, I shared a sadly amusing image about how the modern political process has degenerated into two wolves and a sheep voting what to have for lunch. I was making an argument in that column against majoritarianism (and that is a critical issue, as explained in this video), but there’s also a very important moral component to this debate. Walter Williams addresses this issue in his latest column. He starts by asking a hypothetical question. Suppose I saw a homeless, hungry elderly woman huddled on a heating grate in the dead of winter. To help the woman, I ask somebody for a $200 donation to help her out. 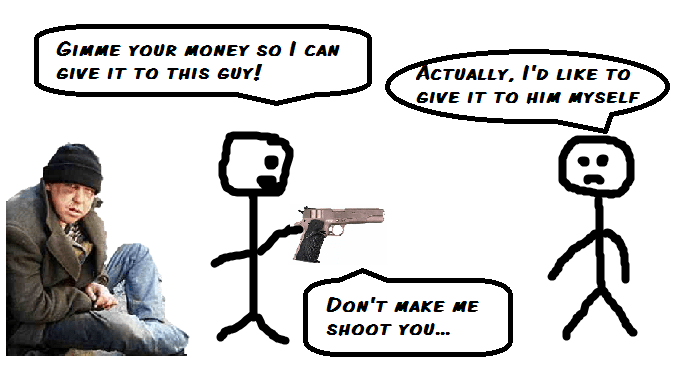 If the person refuses, I then use intimidation, threats and coercion to take the person’s money. I then purchase food and shelter for the needy woman. My question to you: Have I committed a crime? I hope that most people would answer yes. It’s theft to take the property of one person to give to another. In other words, it doesn’t matter how Person A wants to spend money, it’s wrong for Person A to steal from Person B.
Walter than asks some critical follow-up questions, all of which are designed to make readers realize that theft doesn’t magically become acceptable simply because several people want to take Person B’s money. Would it be theft if I managed to get three people to agree that I should take the person’s money to help the woman? What if I got 100, 1 million or 300 million people to agree to take the person’s $200? Would it be theft then? What if instead of personally taking the person’s $200, I got together with other Americans and asked Congress to use Internal Revenue Service agents to take the person’s $200? The bottom-line question is: Does an act that’s clearly immoral when done privately become moral when it is done collectively and under the color of law? Put another way, does legality establish morality? Amen. Walter is exactly right. And this is a point I need to internalize. I’m often writing about the economic evidence for smaller government, but I suspect advocates of economic liberty and smaller government won’t win the debate unless we augment our arguments by also making the moral case against government-sanctioned theft. And perhaps one way of getting this point across is to educate people about the fact that we used to have a very small federal government with little or no redistribution. Walter elaborates. Here’s the bottom line according to Professor Williams. We’ve become an immoral people demanding that Congress forcibly use one American to serve the purposes of another. Deficits and runaway national debt are merely symptoms of that larger problem. Though I would slightly disagree with the way Walter phrased it. I would argue that a bloated government is the symptom of growing immorality. Deficits and debt are then symptoms of that problem. P.S. I want to quickly address another issue. When I quote Art Laffer, I’m almost always going to be in agreement with what he says. But, as I wrote last year, we’re in disagreement on the issue of whether states should be allowed to tax sales that take place outside their borders. And now Art has a short video that rubbed me the wrong way. I agree, but this is why I’m against the so-called Marketplace Fairness Act. That legislation would allow state governments to tax outside their borders. Simply stated, a merchant in one state should not be forced to collect taxes for a government in another state. P.P.S. This also explains why FATCA is such horrible legislation. It is an effort by the U.S. government to coerce banks in other nations to enforce bad IRS law. If we care about liberty, we should make sure the power of government is constrained by borders. Although I play basketball (poorly), I’m not a fan of the NBA. As such, I don’t pretend to have much interest in the Donald Sterling controversy. Some people have wondered whether his rights to free speech are being infringed, but I disagree. He obviously has the right to say whatever he wants, even if he makes himself look like an idiot. But the National Basketball Association is an organization that has certain rules, and it presumably has the right – by virtue of the contract among team owners – to impose disciplinary measures. In other words, Sterling has free speech, but that doesn’t mean he is free from consequences if he says something dumb. Just as I have free speech at the Cato Institute, but also would suffer consequences if I said something offensive about a particular group (or, for that matter, if I started supporting tax hikes, bigger government, and statism). And that’s a good thing. As a libertarian, I don’t want the government policing speech, but there’s nothing wrong with private sector penalties on racists. And that’s the topic of today’s column. The free market is a powerful and under-appreciated tool for punishing racism and rewarding color-blind behavior. Here’s some of what Walter Williams wrote on the topic for the Washington Examiner. He starts by pointing out that Sterling certainly wasn’t racist when making decisions about what basketball players to employ. Though Sterling might be a racist, there’s an important “so what?” Does he act in ways commonly attributed to racists? Let’s look at his employment policy. This season, Sterling paid his top three players salaries totaling over $46 million. His 20-person roster payroll totaled over $73 million. Here are a couple of questions for you: What race are the players whom racist Sterling paid the highest salaries? What race dominated the 20-man roster? The fact of business is that Sterling’s highest-paid players are black, and 85 percent of Clippers players are black. Walter draws the obvious conclusions, and he cites the path-breaking research of the late Gary Becker on the economics of discrimination. How does one explain this? …Let’s use a bit of simple economics… First, professional basketball is featured by considerable market competition. …There’s open competition in joining both high-school and college teams. You just sign up for tryouts in high school and get noticed by college scouts. Then there’s considerable competition among the NBA teams in the acquisition of the best college players. Minorities and less preferred people always do better when there are open markets instead of regulated markets. Recently deceased Nobel Prize-winning economist Gary Becker pointed this phenomenon out some years ago in his path-breaking study “The Economics of Discrimination.” Many people think that it takes government to eliminate racial discrimination, but economic theory predicts the opposite. Market competition imposes inescapable profit penalties on for-profit enterprises when they make employment decisions on any basis other than worker productivity. In other words, the free market pushes people to make decisions on the basis of ability rather than race. The takeaway from the Sterling affair is that we should mount not a moral crusade but an economic liberty crusade. In other words, eliminate union restrictions, wage controls, occupational and business licensure, and other anti-free market restrictions. Make opportunity depend on one’s productivity. And as you can imagine, Walter speaks with authority on these issues. And he’s right that the free market is a weapon against racism. By contrast, when government gets involved with race issues, you often get nonsensical results, such as EEOC penalties against companies trying to weed out criminals, or legal harassment of financial institutions for trying to make sensible loans.